Well, I wish I had better news but with all the stress and excitement in my life over the past year, I really need to focus my energy where it is making the most difference. So, I am shutting Salsalluminatti down. Thanks. The in-store samplings are going well. It’s an interesting mix of reactions that run the gamut from “this reminds me of a sauce my mother used to make, but she is long gone. I’ll take a bottle!” to “meh, I like mine better.” Gee, um, thanks! We do have to say that although we enjoy being in both stores, we have a preference over which store we are in. There is definitely a difference in the clientele’s gregariousness. Our sales are both roughly the same, but one store the customers smile and acknowledge our presence even if they don’t stop. In the other unless they are stopping for a sample, they avoid eye contact at all possible costs. Come on, people. We are not going to force you to sample our sauce, and you are not going to hurt our feelings if you don’t want to try it, but please, the smiles like the samples, are free. We are set up finally to go back into the lab for our next three sauces and get the product line expanded. We are currently setting up the ordering for it, but it looks like we are going to have to buy more of one of the products than we need and then lose part of it. It’s not ideal, and we are not happy about it, but its what we have to do. The sauces are going to be a vinegar, a steak sauce, and a chutney. Per our style, they are going to have unique bases, and flavor profiles will be a departure from the norm. Not that they are an attempt to, as the kids say, “disrupt” the condiment game, but for us to have our own clear voice. The next bottling is going to feature our updated label and we are going to carry that across the whole product line. It’s not a massive departure from what we are doing now, but will be a little less old school formal label(while still adhering to FDA rules). Well, It’s the new year and we have made or yearly donation to Give Kids The World Village in Kissimmee, Florida, a place for critically ill children and there families to get away from all the worries of the world and treatment and just be kids again for awhile. One of the more fun details of the place is that the ice cream parlor opens at 7:30, because if an ill child wants ice cream for breakfast, they should get it(and hence the blog post title). In other news, we have announced the winners of our holiday give away and will be sending their shirts and bottles this week. I’m hoping to get back to a little photography tonight, and should be back in the lab in the next two months for expansion of the product line. We’re here to drop the edit on Logan’s cooking show at 350 Main Brasserie in Park City with Chef Matthew Safranek of Salsalluminatti and 350 Main. Thank you, Make-A-Wish Utah! On the 8th of December we did a little cooking show for Logan from Make-A-Wish Utah at 350 Main Brasserie. First he got his hair cut by our friend Jenna at Barbarian Barbering Company, and afterwards his family stayed in town in one of Park City Rental Properties units. I had a great time. We made fresh egg yolk angel hair with butter, parmesan, and nutmeg. Ho, Ho, Ho...Ho, Ho, Ho...Ho, Ho, Oh, Well. Read it and find out. It ain’t too long. Don’t be lazy. 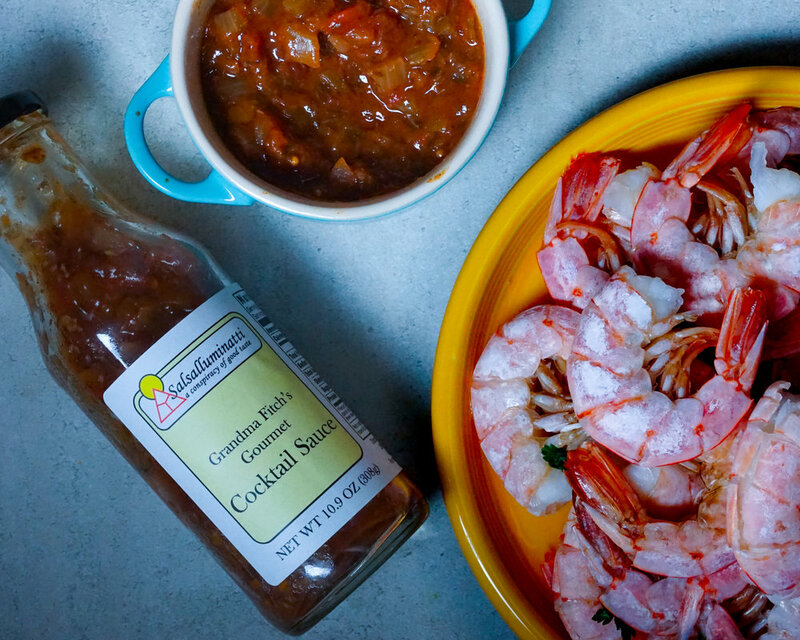 Win a bottle of Grandma Fitch’s Gourmet Cocktail Sauce and a T-Shirt! This is where I am supposed to put an excerpt, but the way I figure it, the excerpt has never actually drawn me into a story. The headline/title does, and my headlines have not a whole lot in general to do with the content so why start here. I have been working on getting on the Amazon Marketplace, which has it’s own set of issues, but honestly is not moving as slowly as the co-label situation and the Rocky Mountain region of a national chain’s acceptance. It moves the way it moves, and while moving at a snails pace for me, I understand it is normal as I am technically out of my regular area of food service. I have been continuing to work on recipe development for the next few sauces. I keep thinking I have them where I want them, and then have a thought and have to give it a test before I head into the lab. I probably would be pushing myself harder to get solidified recipes, but don’t want to commit to the outlay of money while I am sitting my first batch of cocktail sauce. They are more sauces based on vegetables and not ketchup/tomato paste with lots of spices and fun(!). I have my first two trademarks approved and have until January 15th to finish the paperwork and pay the final fees which I am stoked about. I don’t really think that anyone was going to jump on any of my “creative work” so soon, but need to have them in place for hopeful eventual buyout, but then again, when things do take off who knows what sort of copycats will show up to the game. I have started running again and have my eyes on the Triple Trail Challenge for next summer. A trail half marathon in June, the Jupiter Peak Steeplechase in July. and the Mid-Mountain Marathon in August. I am toying with the idea of Running the Dopey Challenge at Walt Disney World in January of 2020, and while feasible, it is wedged between Christmas Break and Sundance Film Festival, so that is what the real challenge is for me, getting away and being able to race and still have enough fun in the parks to really justify a trip to Orlando. Give Kids The World Village was started in 1986 by Henri Landwirth who had been hosting children with life-threatening illnesses at his hotel in Orlando. The impetus of creating the charity was the loss of one of the children, Amy, to leukemia before all arrangements could be made to fly her down to visit Walt Disney World. He wanted to make sure that no child would be failed again. Salsa IIluminattus, "The Core Values EP"
Continuing with our core values blog post motif we bring you the next installment in the 11 part trilogy now showing in IMAX 3D. 5) Earnestness- We believe in an earnest approach to our marketing. Webster's Dictionary defines "Earnest" as "Hey Vern!" Wait, what? (heavy sigh) Nevermind. 6) Humility- We certainly do not believe we have all the answers. We are just a group of people working for a shadow organization who love good food, and telling you what you should be eating and how you should conduct your life. 3) Integrity- Integrity is a word that gets bandied about by corporations these days and we are no different... except we mean structural integrity. We guarantee that our products will remain molecularly stable and not spontaneously collapse in on themselves turning into a singularity ensuring the end of existence as we know it. We will show our commitment to the structural integrity of our product by backing it with this financial pledge: "Salsalluminatti guarantees all it's products against causing the end of the universe or double your money back." 4) Uniqueness- While being unique does not make something important, our goal is not to go head to head with major manufacturers. Our goal is not to destroy them or overtake them. Our market is people who are pressed for time and tired of the same old condiments, and aren't excited about having a spicy version condiment X to light a fire under their taste buds. Flavors and textures must be unique. If people want the same old ketchup, mustard, hot sauce, and barbecue sauce they have enough options already. We must strive to come at them obliquely, and maintain some reference point without aping them. 1) Whole Vegetables- We do not manufacture condiments using tomato paste. Tomato paste is a crutch in the condiment world and while it makes for an affordable sauce, it stifles creativity when there are so many other vegetables out there to base condiments on. What we strive for is uniqueness, and we would rather approach common condiments obliquely and develop something with interest to it, as opposed to going head to head with powerhouses like Heinz and hope that one minor tweak is all it takes to differentiate ourselves. 2) Humor- In addition to our focus on unique flavors we feel that an irreverent, nonsensical sense of humor is key to setting ourselves apart and not coming off as a bunch of self-rightous, arrogant gatekeepers. While we present different approach to our condiments, selling them from an elitist perspective will hinder our growth and we do not wish to be only associated with those "in the know." I don't know. These are just a start and these are going to need some revising, but I do feel that this base is what has been a part of our culture thus far, and what is driving our other product development. Well, I got to see the completed bottles, finally. They look great, and I am ready to get this batch sold. I am continually learning new things about the process, not so much the production, but the business end. And the excitement remains. I am still waiting to hear about the co-label situation, but am fairly optimistic that it will go through. The other chain I am waiting on is also a slow process, but I am pretty sure that is me as a Chef who is used to a fast pace on projects, not me as a manufacturer where things move slowly. We made a donation to Give Kids the World Village as it was the end of our first year of being in operations and did more than we had to, just to make it meaningful. We will do it again at year end, to get on schedule with the fiscal year. Whew! I finally have found what I am looking for in a business book. No, not "The Introvert Entrepreneur," which, yes, I am still enjoying, but in The Ten Day MBA, by Steven Silbiger. Finally, a business book that talks about the exciting world of accounting! I am serious. I am really serious. While my post-high school training did include recipe costing, inventory, and menu pricing, it did not cover the world of Cash and Accrual Accounting, Cash Flow Statements, and Income Statements. Granted, my understanding after having read the chapter is still pretty fuzzy overall and I have a lot of questions that need answers, but thankfully I have a few friends with MBA's and know an accountant or two that I can bounce questions off of, and I after I finish this book I am going to pick up a book strictly on accounting and hopefully focus my understanding. 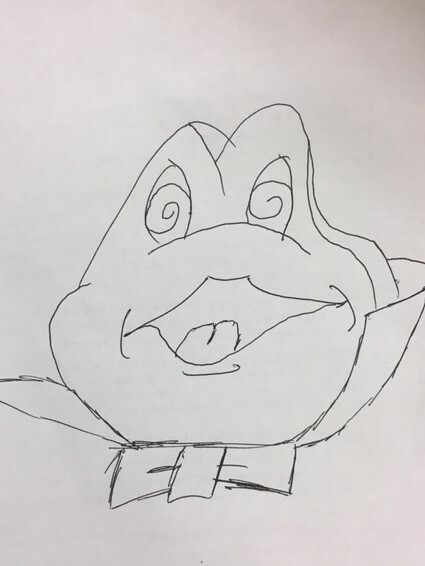 For no reason, whatsoever, here is a 30 second sketch of Mr. Toad with Motorfever I did it from a old petition to save Mr. Toad's Wild Ride at Walt Disney World. WDW lost a classic, but thankfully it is still at Disneyland. Tomorrow it will have been two weeks since I cooked up batches of three different test sauces. The sauces have to sit for two weeks, so that all the flavors fully meld. Even if we allowed them to cook longer the sitting around would continue to draw flavors out of the spices, so it has to be tasted after a couple of weeks to check that what it tastes like after it has gone through shipping and sat on the shelves for a little bit is what we actually want it to taste like. We tasted one of them Sunday with some chicken, and I am pretty excited as to where it is at. Thursday is my day off from my day job and we are going to test all three. The best news about the sauce we tasted Sunday is that the probably name for it references a color and it is actually that color now, unlike the last batch that due to a minor ingredient difference turned a different color. Once I am sure these are ready to go, I will set up a minor production test. "R-E-J-EEE-C-T, Find out what it means to me!" As a chef, you have to develop a thick skin. Sometimes people get vicious about work we do, even when we do it properly. I have had a review here and there that have been soul crushing, including a long ago phone call to my boss that I should be fired, which was especially disappointing because the dish that they had that they hated so vehemently was one that I was not able to take off the menu at that restaurant because the locals/regulars would have lost their damn minds. So, it comes to me as a great surprise, that when i received my first rejection letter for my sauce that I pretty much laughed and shrugged it off. I'm guessing it's because they hadn't even gotten to trying it yet, so it was not as if they were rejecting my work personally, and at any rate they were the chain of stores that wants to do the co-brand anyway. It also felt good to get the first one out of the way. I am working on other routes and it looks the whale will not be of the white kind. But, nothing is certain. Well, I mocked up the label for the co-brand and it will be presented this Wednesday to the chain. I am stoked with the way it turned out, but won't be heartbroken it the want it modified a bit, if it means they'll stock the sauce. They just have a current look to the product they are carrying and want consistent branding, which if they sell it, is no worry of mine. I finished the Disney business book and enjoyed it overall because there were a few little Disney tidbits in it that I did not know and a few I know to be false from all the other reading on Disney I have done. I powered through another business book last night which I could tell I would hate within the first 10 pages or so. It took 200 pages to say what it could have in a short blog post. It felt like it was mostly anecdotes and sales pitches for the authors other books and seminars. Barf. Later in the evening last night I started a book called The Introvert Entrepreneur. So far, I am into it, since it seems to have a bit more applicable information for me. Apropos of nothing, watch the series GLOW on Netflix, binge watching the second season was a very enjoyable way to spend the later part of my night with my ladyfriend and our daughter. Free Shipping On All Orders From Now Through September 21st! Swing by our online store and buy some stuff and all shipping is on the house! 1% of all sales goes to Give Kids The World Village in Kissimmee, Florida, benefiting children with life threatening illnesses and their families! "Happy Birthday, Salsa Luminati" No, That's Salsalluminatti. "Sorry! Happy Birthday, Sauce Illuminati!" Nooooo, It's Salsalluminatti! "Sorry, Happy Birthday...to you." We are now one year old and we just had our first full production run. We, well, I, are pretty excited about that and will be meeting with some local grocery stores soon. Production day went pretty uneventfully, which is great. I haven't heard that the label machine is eating my labels like it did on the big batch test date, so I'll take that as a good sign. This coming Sunday I am going to get back to home tests of future sauces, mostly just to double check the recipes to see that they will produce again properly, and then hopefully back into the lab to get these off the ground. They are more sauces based on vegetables, and totally tomato paste free. Keep that ketchup out of here. It's great for burgers and fries, but keep it away from your steaks and seafood. As always our sauce is for sale online so feel free to drop by and pick up a case or two and buy a couple of shirts while you're at it.